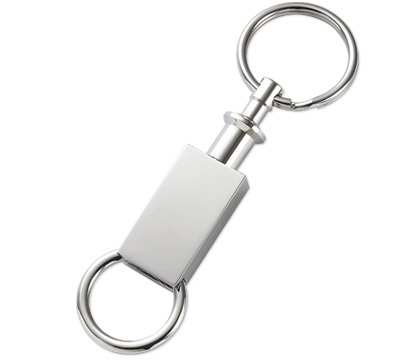 This two piece silver detachable keychain is ideal for seperating your house and car keys, great for valet parking. Simply press down on the long side of the ring to unlock and separate each set of keys. This custom valet keychain is a very useful and practical accessory for everyone. The engraved silver keychain has a wonderful polished non-tarnish silver finish that can be personalized on both sides.